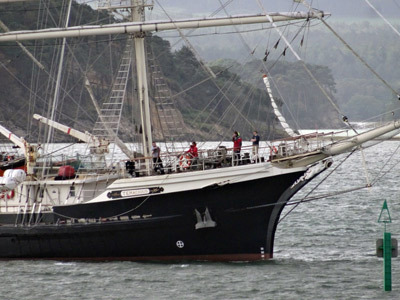 On our recent trip to the Dorset coast we were lucky enough to see several tall ships – and after a bit of research I think I can now tell the difference between a barque and a barquentine. Did my eyes deceive me? Tall masts in the distance? It made very good speed, as of course it was being powered by its engine, not sails. 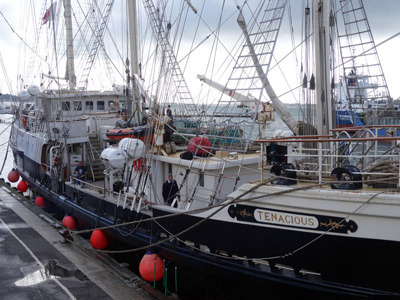 Of course I immediately Googled the Tenacious and found that it belongs to the Jubilee Sailing Trust and was built in the late 1990s with the help of a National Lottery grant paying 65% of the costs. It first sailed in the year 2000. Read more about it here and on Wikipedia here. 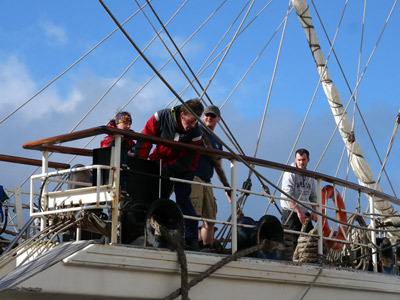 The trust is a charity with a mission to integrate people over the age of 16 of all physical abilities through sailing adventures on two tall ships – the Tenacious and the Lord Nelson. 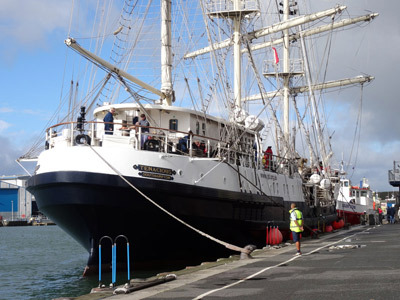 We quickly got our act together and headed out to see if the Tenacious had moored. 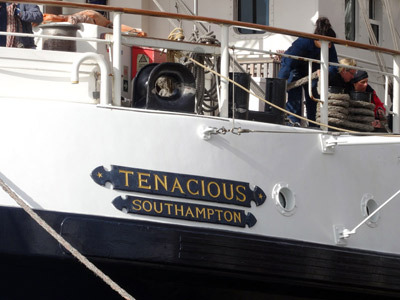 The Tenacious is a barque. 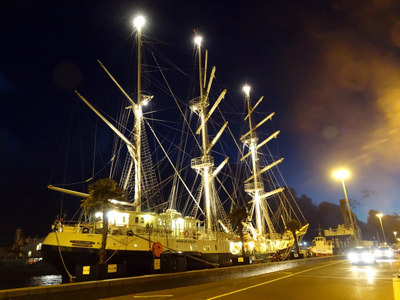 In general terms there are three sorts of square-rigged three-masted tall ships. 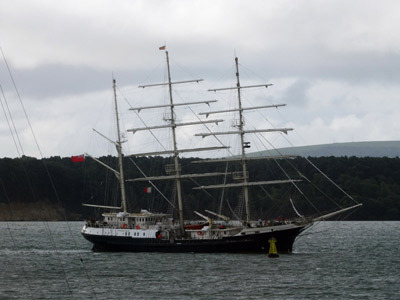 The three masts are the foremast, main mast and mizzen mast (the one nearest the stern). 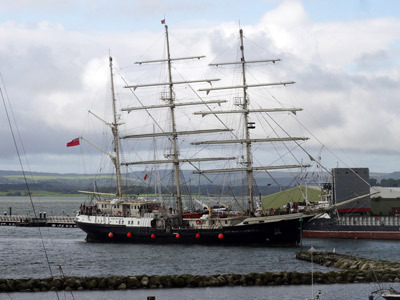 If all three masts have square sails it’s fully rigged. 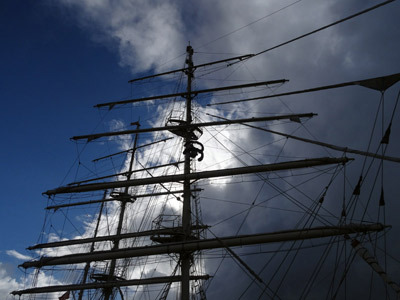 I can recall as a child memorising the names of all the sails on all the masts, just for fun. I particularly liked to shout “Hoist the t’gallants!” I must have heard this in a movie somewhere. 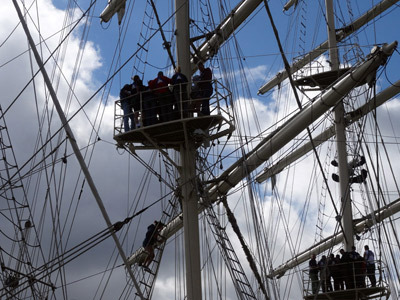 It refers to the “topgallant” sails, just below the topmost sails. I can only think they were the ones you resorted to when you really wanted to get a bit more extra speed, but I could be wrong. 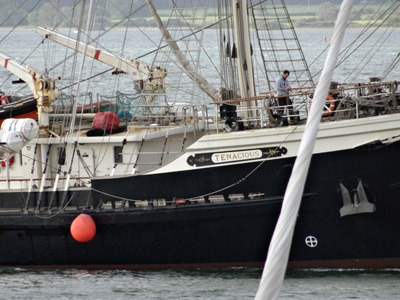 If two masts have square rigging it’s a barque like the Tenacious. 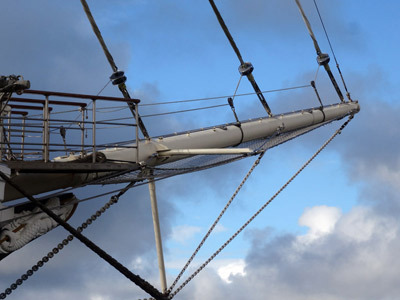 The mizzen-mast has fore-and-aft rigging, which looks more or less triangular and is easier to handle than the square-rigged sails. 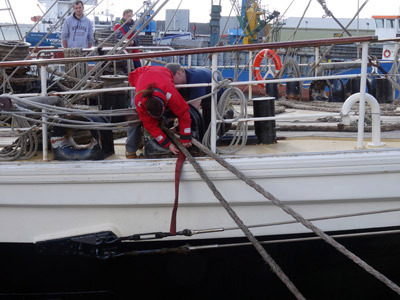 Even easier to handle is a barquentine. 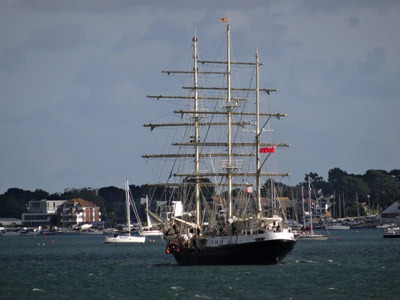 We encountered a barquentine in Weymouth. 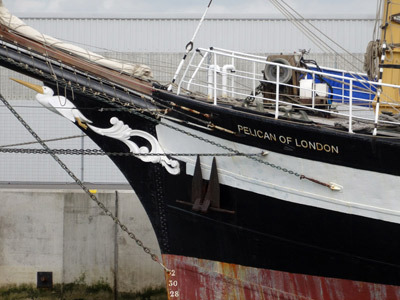 While the Tenacious was built from scratch as a sail training vessel, the Pelican of London was built in France in 1948 as an Arctic trawler and then worked as a coastal trading vessel. 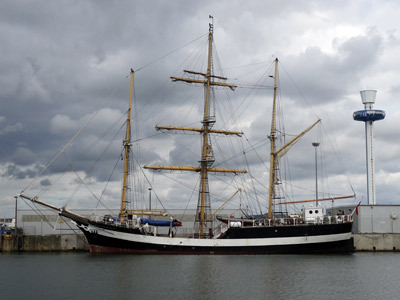 In the late 1990s she was sold and stripped back, to be transformed over 12 years into a barquentine. 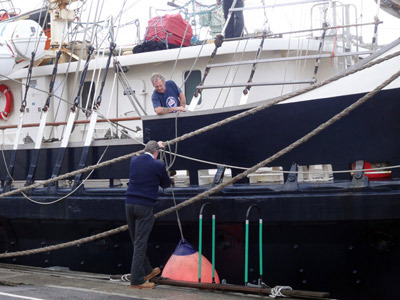 She is now used by the Weymouth-based charity Adventure Under Sail for sail training for career and personal development. Annoyingly the naming of ship types is not as clear-cut as I first hoped. 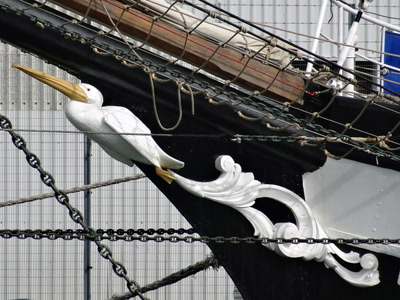 Although the Pelican of London is a barquentine it is a rarity, possibly unique, as it’s the main mast that is square-rigged instead of its foremost mast. 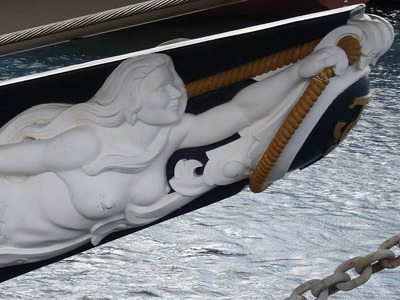 Wikipedia doesn’t even have a sail-plan diagram of such a design. 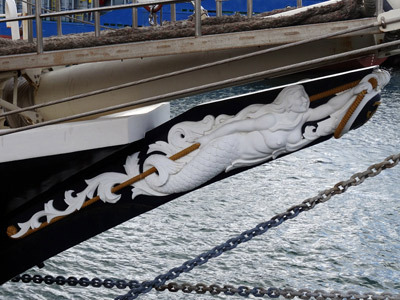 It has been likened to a xebec or polacca (polacre) used in the Mediterranean, often by pirates, in the 18th century and 19th century. 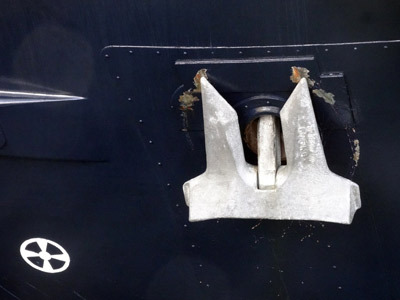 Many sail-plans were used in a bid to get more speed and use fewer crew. 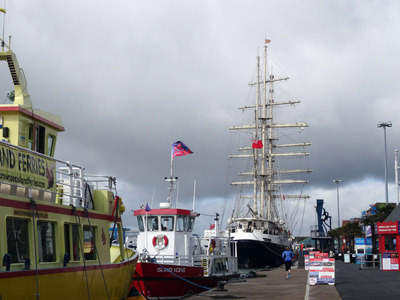 I did say we saw “several” tall ships. 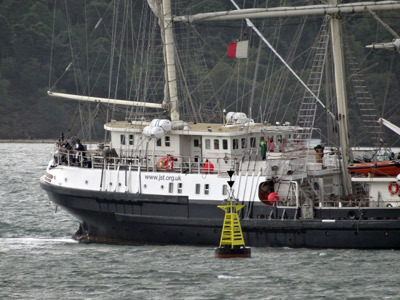 The others were a lot smaller – the John Laing belonging to the Ocean Youth Trust South and an old favourite the Queen Galadriel, a former Baltic trader now run by the Cirdan Sailing Trust. 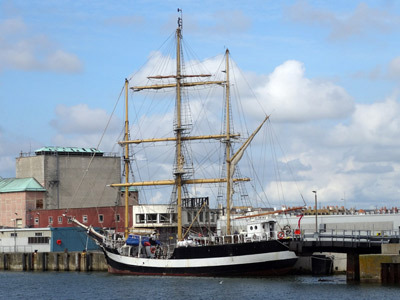 I blogged about the Queen Galadriel in Poole in 2010 here. LOVE this post Pat. 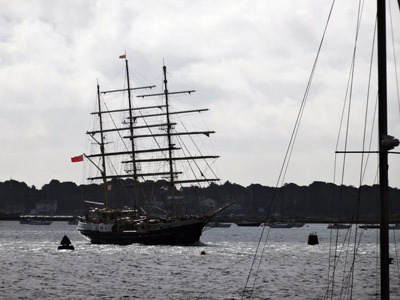 There’s usually lots of interest in the tall ships when they sail in but I’ve never really thought any more about them. Thank you. I’m pleased. 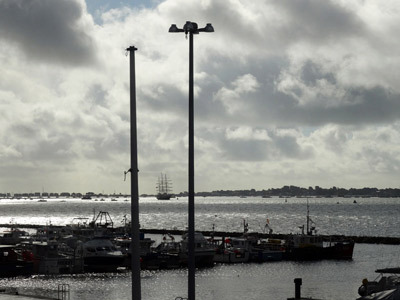 I half looked out for you when enjoying a coffee in the Quay cafe in Poole – in the rain – after your recent post about the area. Last week I went to Parkstone by train, from the west. The weather was glorious and the views across the Harbour and Poole Park lake were excellent. What a wonderful sight to wake up! Thank you for a fascinating insight into these beautiful craft.